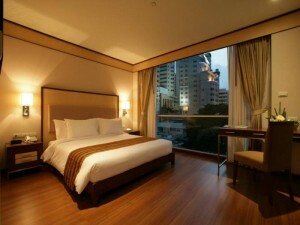 Adelphi Suites is a modern and luxurious four star hotel on Sukhumvit Soi 8. 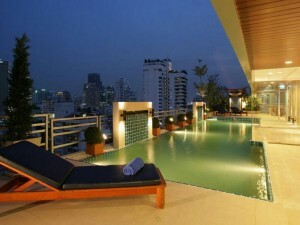 The hotel’s outdoor swimming pool has a great view of Bangkok’s skyline and is a great place to relax and enjoy the evening. Rooms are closer to full serviced apartments than hotel rooms, with kitchen facilities, fast free Wi-Fi and plenty of space. The furniture is modern and beds are comfortable. Rooms are kept very clean. Adelphi Suites is located right near the beginning of Sukhumvit Soi 8, meaning Nana BTS station, Nana Plaza and Sukhumvit Soi 11 are all just a few minutes walk away.